WHAT ARE THESE PASSAGES PROPHESYING ABOUT? Whether it is in small things or great things, whatever the Bible says is true. Beyond the spiritual matters in the Word of God, even in physical, geographical and historical matters the Word is true. In the great matter of a worldwide flood the Word of God is clear. It took place over all the world covering the highest mountains. It destroyed all land animals and people except those in the ark of Noah. Gen. 7:19-22, 2 Pet. 2:5 In various cultures there is a ‘flood’ tradition. Some have claimed that the flood in Genesis was also ‘local’. Wrong, the traditions of floods in various cultures simply reflect the truth of the worldwide flood. At times over the years individuals written of in the Bible have been questioned as really existing. One ruler that the unbelievers claim did not exist is Belshazzar in Daniel chapter five. He is referred to as the ‘son’ of Nebuchadnezzar and Nebuchadnezzar is referred to as his ‘father’. From secular history we learn that Nebuchadnezzar had no such son. Of course the terms ‘son’ and ‘father’ are used in a wider sense. Jesus was the ‘son’ of David, but not the direct son of David in the next generation. We refer to our ‘fathers’ in a broad sense as those who have gone before us. So there is no problem with this word usage. And there is the possibility that Nebuchadnezzar was Belshazzar’s grandfather on his mother’s side. For the longest time secular history gave no confirmation of such a man, Belshazzar. But then discoveries were made in cuneiform records that such a man did exist. From historical and archaeological records it appears he was the man also called Gubaru. This is a reminder that man’s historical records and archaeological discoveries will confirm what the Bible says over time about names, dates, geographical facts, etc. We trust God’s Word for it is truth. 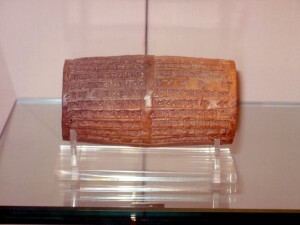 The Cylinder of Nabonidus from the British Museum in London – Three of the lines read “Belshazzar the son first born the offspring of my heart”. 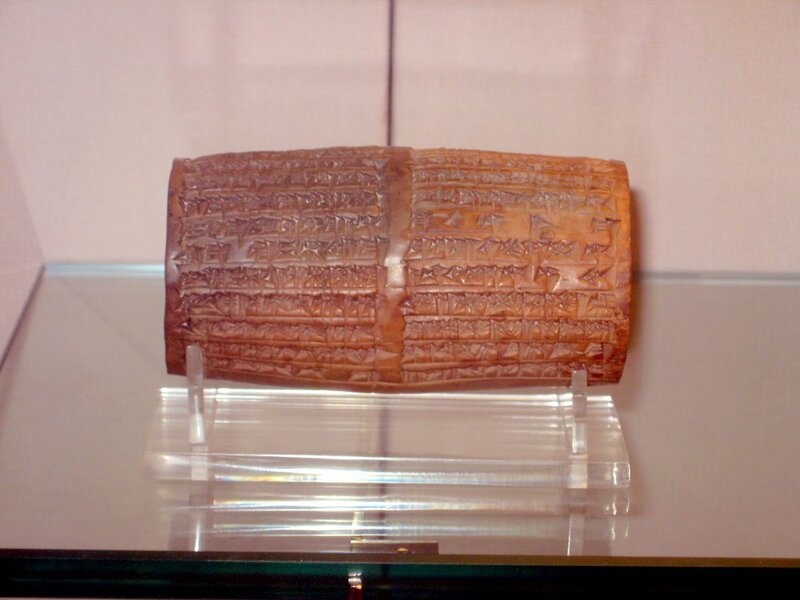 This cylinder proves the biblical account that names Belshazzar as acting king of babylon at its fall, a fact long disputed by historians since it was well known that Nabonidus was the last king of Babylon. In Joshua 10:13 we read that “the sun stood still, and the moon stayed…” This miracle God brought about that His people might gain a great victory over their enemies. The language is normal in conveying the meaning. Still today we talk about the sun rising and setting, even though we know that the earth revolves around the sun on its axis. God gives the picture in language we understand of a great suspending of laws of nature. The God who set up the laws by which this earth and all creation operates can also suspend the laws or modify them for His purposes. The size of the great city of Nineveh in Jonah’s day is said by Jonah to be three days journey. 3:3 This is that the circumference was about 90 miles. The travel into the city a day’s journey by Jonah does not mean that he traveled a full day or that he went in a straight line. He may have wound around through the winding streets. As Jonah began to go a day’s journey into the city he found a place where he could preach his message. When Mary and Joseph traveled a ‘day’s journey’ it is obviously referring to traveling for one day. A ‘sabbath day’s journey’ was about 3/4 of a mile. On the sabbath there was to be no work done. And so a short walk was considered not work.